Casa San José has 6 large bedroom suites, each featuring its own well developed sense of character and individuality. Exceptionally well sized, these rooms have the feel of grand private suites. Each bedroom has its own en-suite bathroom and lounge area with fireplace. 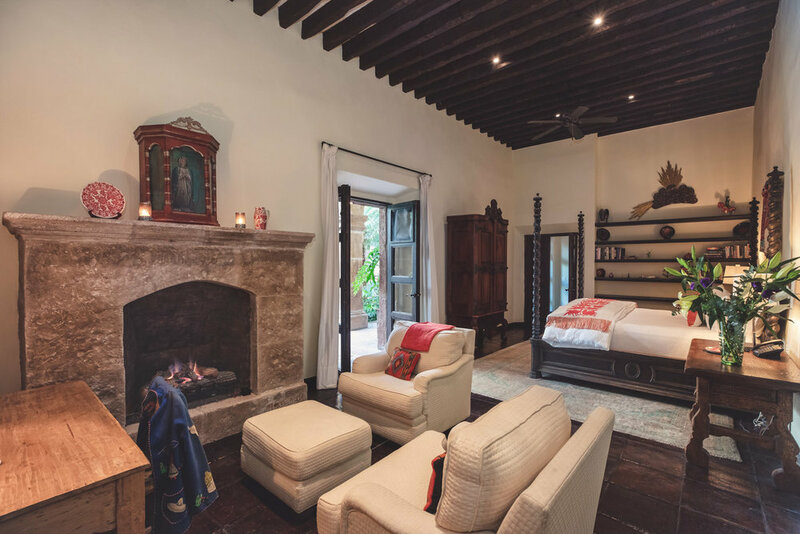 The bedrooms within Casa San José display gorgeous historic design elements throughout. Items include antique furniture, a variety of local and national Mexican artwork, religious nichos with featured saints, and four-poster beds with traditional embroidered Otomi pie de camas or bed scarves. 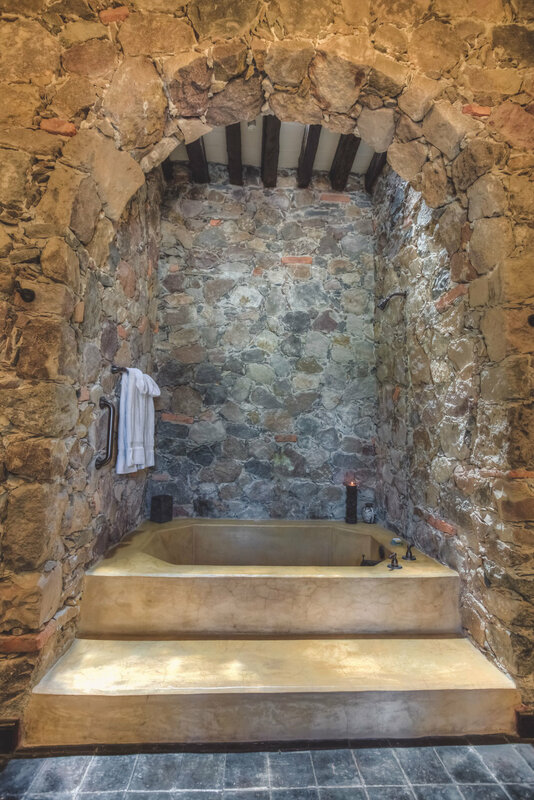 The en-suite bathrooms have some dramatic architectural features, including Gothic stone archways encasing Romanesque-style soaking tubs. 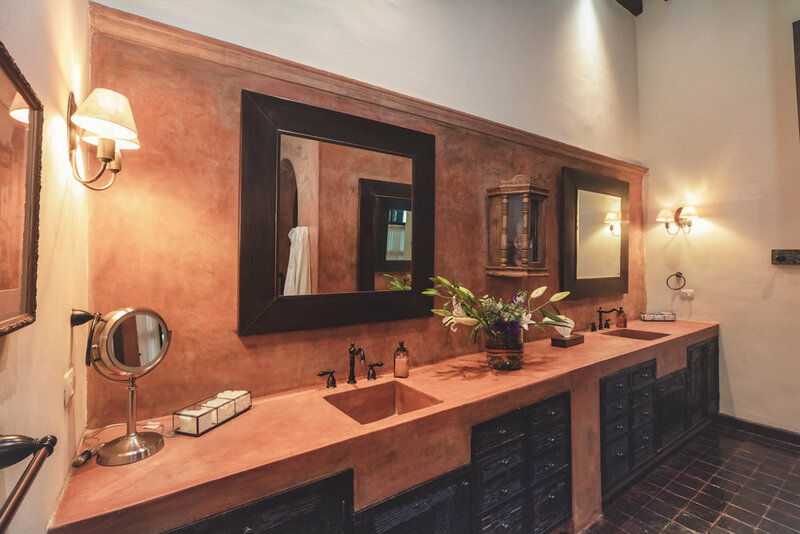 Casa San José has elegant fixtures and fittings throughout, including double vanities and walk-in showers. Colorado is decorated in soothing, neutral tones with a subtle introduction of a deep red that brings the room to life. The bedroom’s nicho features a statue of Mary, undoubtedly Mexico’s favorite saint. This is just one of three Marys that can be found in Casa San José. An antique huipil from Guatemala hangs above the bed, while a colorful painting of a market scene in Oaxaca sets the tone in the lounge area. Colorado has direct access to the central courtyard. The bathroom features a large alcove with frosted privacy glass, which hosts a walk-in shower and a sunken bathtub. Verde features warm shades of green as its overall color scheme. The bedroom is decorated with an antique Mexican wedding trunk and a variety of traditional pottery collected by the owners from Oaxaca, Tlaquepaque, and San Miguel de Allende. The bedroom has comfortable oversized leather chairs set around a welcoming fireplace. The nicho above the fire is from Guerrero and features Our Lady of Guadalupe, the patron saint of Mexico. Naranja is decorated in wonderful tones of soft oranges and vibrant turquoises. 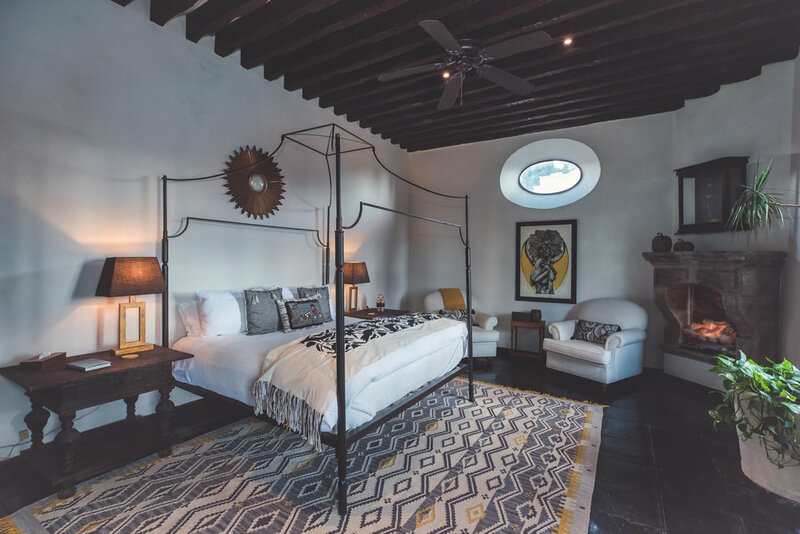 This large bedroom has a tranquil painting by local San Miguel artist, Lola Picó, and an Ernest Lacy piece depicting the Day of the Dead in Oaxaca. The nicho features one of San Miguel’s favorite saints, Saint Benedict. San Benito medals are thought to ward off evil. The little santo on Naranja’s mantle protects the room from any bad spirits. Naranja is decorated with some charming pieces of antique furniture, including a Mexican wedding trunk. 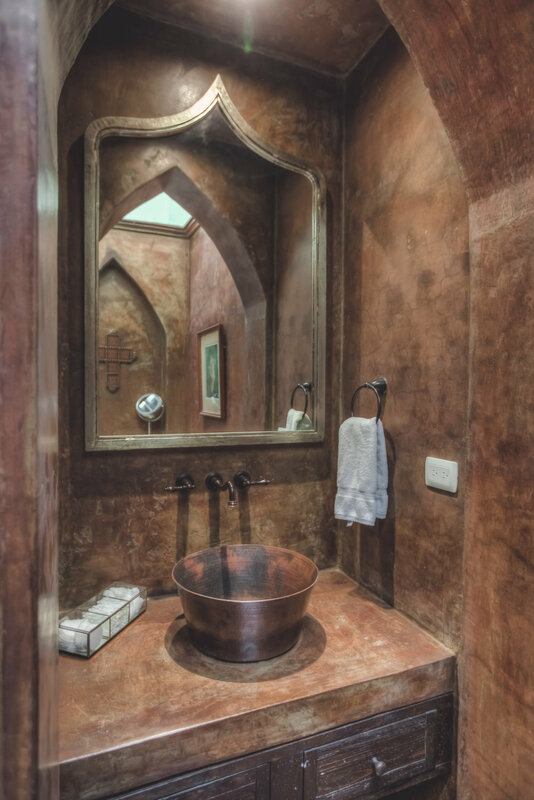 The bathroom has a large double vanity and a separate bathing alcove with a soaking tub and shower. Siena boasts an impressive Canterra entryway. 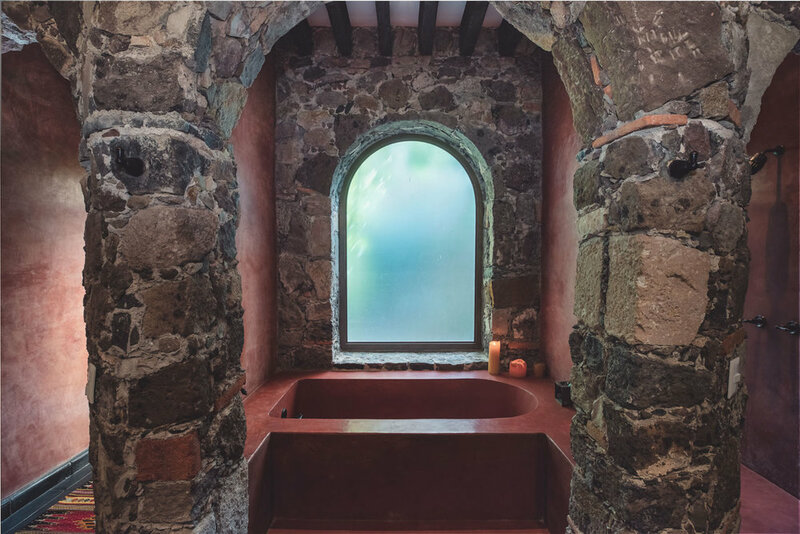 It dates back to Casa San José’s original colonial-era construction and is a good representation of the historic stonework on display throughout the house. This inviting bedroom has warm tones of gold and brown, which contrast wonderfully with the king-sized wrought-iron four-poster bed. An impressive painting by San Miguel artist A Von Z, Árbol en Armonía de Paz, hangs on the wall. The theme is also extended to the Oaxacan “tree of life” rug in the dressing area. Siena’s nicho features another image of the patron saint of Mexico, Our Lady of Guadalupe. The bathroom has a large walk-in shower. Sol was aptly named for the generous morning light that brightens the room. Guests can enjoy waking to views of the sun rising over San Miguel, including sight of early morning flyovers from floating hot air balloons. Sol’s color scheme marries striking gold tones with stark black accents. The room is decorated with a lovely woodblock print by young Oaxacan artist, Irving Herrera, rare ceremonial bear masks from southern Mexico, and a nicho featuring San Francisco, the patron saint of animals and nature. The bedroom has an iron four-poster bed and the bathroom has a large soaking tub within an impressive stone cove. Designed in shades of cream and blue, Cielo is as heavenly as its name would suggest. This sixth bedroom is furnished with two twin beds, which can be reordered as a king-sized bed upon request. The room has a TV and a private patio that overlooks the pool. This bedroom has an eye-catching antique dressing table, a painting of El Charco by part-time San Miguel resident, Richard Trumbull, and features whimsical folk art puppets and fun art pieces inspired by the Mexican game, Lotería. On the mantle you’ll find a nicho with San Pedro, who as the name of the room suggests, holds the keys to heaven!